When I visit poor communities around the world, it's usually the mothers I see. They're doing the tough, hands-on work, ticking off a daily to-do list to care for their children despite difficult conditions. Often the men are somewhere else, maybe contributing to the family, maybe not. It's easy to develop a dim view of dads in this context. But on a trip to northern Iraq last month, I met a man who lives up to the high calling of being a father. He reminded me of how a family draws strength from their father's faith. Raad, 48, lives like a refugee in his own country - the technical term is "internally displaced person." He is a wheat farmer forced off his farm, and now he and his wife and four children live squeezed together in one room of an abandoned building in Erbil, the capital of the Kurdistan region of Iraq. But at least they are all together and safe. 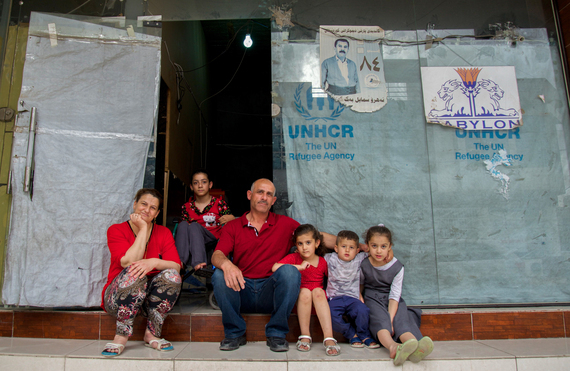 In August 2014, Raad and his neighbors fled their village, Qaraqosh, near Mosul. Armed groups were spray-painting the Arabic letter "N" for Nazarene on Christian homes like Raad's, targeting them for abuse and maybe death. Raad loaded his family and few belongings in their car and drove for safety, but at one of the checkpoints, his vehicle was confiscated and they had to continue on foot. That wasn't possible for Raad's oldest, 13-year-old Marlien, who is disabled. So Raad picked up Marlien, the apple of his eye, and carried her in his arms for most of the arduous three-hour walk to Erbil. Now living in their cramped, single room, Raad built beds for the kids - he and his wife, Entisar, sleep on the floor. Their room is close to one of the two bathrooms shared by several families, and through the thin walls the sound of the flushing toilet wakes the children at night. There are some small mercies. Living on the ground floor makes it easy to take Marlien outside. "She wants to see the world," says Entisar. Raad has a part-time, minimum-wage job as a security guard. The two middle children, Ramina and Mirna, go to school. Still, it's easy to see what Entisar means when she says, "We live in an open prison." My father's heart grieves for this family. I can't imagine the uncertainty they wake up to every day. They miss their home, their farm, their church. Someone has to have hope, and in this family that's Raad. His eyes twinkle with plans and possibilities. He fashioned a series of shelves on one end of their living space for their meager possessions, and he pounded studs into the walls in preparation for sheetrock and plaster to cover the rough cement, when he has the money to do so. Raad clings to a faith that is unshakeable despite his bleak circumstances. "Nothing is impossible with God," he told me. I have to admit that being in Iraq left me pretty hopeless. Thousands of families like Raad's, as well as Muslims and those of the Yazidi minority, have been living a squatter's existence in Erbil for nearly two years now, with no prospect of going back. Ten years ago, there were 1.5 million Christians in Iraq; now there are fewer than 300,000. Believers are vanishing from the cradle of Christianity. Can it be stopped? I've learned never to underestimate the power of a family to weather great hardships when faith is their anchor. And although there seems to be no end to these Iraqi families' displacement, Raad has given his children a remarkable model of our heavenly Father's love that no doubt will bind them to their loving Father God in the tough times to come.